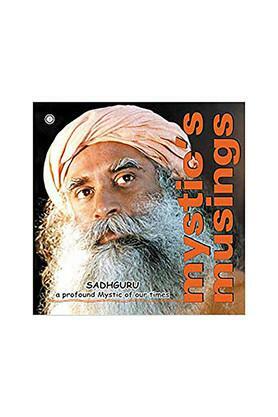 A compilation of The Mystic Eye and Essential Wisdom from a Spiritual Master.In this book, Sadhguru, a mystic of unfathomable proportions intrigues the reader as he dwells upon life, death, rebirth, suffering, karma and the journey of the Self.In a manner that is candid, audacious and unpretentious, he shatters conventional definitions of morality, religion and spirituality and provokes the reader to delve into spaces that are not for the faint-hearted.A book for the thirsty. It is a glimpse of an oasis for someone willing to rise above the intellect and move towards the fountainhead of knowing through the wisdom of an enlightened master., The Times of IndiaMeeting Sadhguru has been the defining moment of my life, changing my perspective on how to look at life and its challenges. Mystic's Musings is a beautiful compilation of some of Sadhguru's essential wisdom., Ravi Venkatesan, Former Chairman, Microsoft IndiaMystic's Musings makes fascinating, thought-provoking, inspiring reading and starts a pilgrimage to the very core of one's existence., D.R. Karthikeyan, Former Director General, Central Bureau of Investigation and National Human Rights CommissionSadhguru is a yogi and profound mystic of our times. An absolute clarity of perception places him in a unique space in not only matters spiritual but in business, environmental and international affairs, and opens a new door on all that he touches. Sadhguru is a yogi and profound mystic of our times. An absolute clarity of perception places him in a unique space in not only matters spiritual but in business, environmental and interNAtioNAl affairs, and opens a new door on all that he touches.